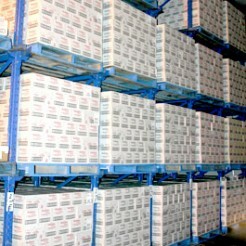 Austco Polar Cold Storage has a maximum storage capacity in the vicinity of 15,000 pallets. We base our general business on 12000 pallets and have 3000 of pallet space in use by Tenants. Rooms can be interchangeable between temperature configurations within a couple of days. This allows us to adapt on depending our clients’ needs. 10,000 pallets of our sites storage capacity is in drive-in racking. we do however have the freezing chambers to allow for block stack or oversized products such as kegs & drums or pallets too high for our drive-in racking. Our plant infrastructure is highly maintained, with regular site inspections of racking and equipment to identify any potential risks or issues and to be able to correct them before they become unsafe or activity affecting. Our drive in racking is ideal for bulk lines, with groupings of 20, 25 and 35 pallets per rack. There is also the ability to mix lines in the racks efficiently using our warehouse management system. All stock can be tracked through the warehouse with online reports available to customers so they can keep abreast of their situation – amount of stock, time it’s been in storage, and so on.